Last Tuesday, I continued my obsession with the “Hottest Band In The Land” by picking up the new KISS – ALIVE! BOX SET. I spent a mere $20 to have yet another copy of ALIVE I, II, and III (remastered of course!) 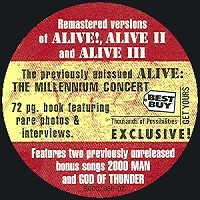 and to finally add the long-lost “real” Alive IV – The Millenium Concert. 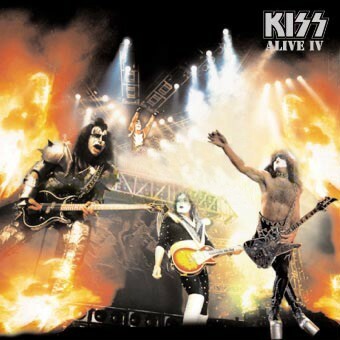 Back in 2001, KISS was to release this album as ALIVE IV but, due to label politics and contracts, it was not to be. Even with the artwork being revealed and ‘Rock And Roll All Nite’ (from Alive IV) being added to the KISS BOX SET, the album was shelved. The band then moved labels from Universal/Island to Sanctuary Music and they released ALIVE IV – KISS SYMPHONY. And the rest is history…..
Basically, this album is the souvenir of the Farewell Tour that KISS mounted in 1999/2000 featuring the original lineup of Paul, Gene, Ace, and Peter. It’s a straight forward recording of the basic set they played throughout the U.S. Tour (I was there for four shows!). It sounds great, it reminds me of the shows. It’s nice to have official live versions of ‘Psycho Circus’ (sans orchestra), ‘Into The Void’, and a live document of the reunited original lineup. All in all a good live album. Three songs that were prominent in the set! For some reason, ‘2000 Man’, ‘God Of Thunder’, and ‘Detroit Rock City’ are absent from the live proceedings. They were part of the Farewell Tour setlist, I have the bootlegs to prove it. So where are they? I bought the Best Buy exclusive release. That meant that my copy of of the box set had two bonus tracks on Disc 4: ‘2000 Man’ and ‘God Of Thunder’…..says so right on the packaging. Turns out the Japanese release in December would have these two bonus tracks plus the elusive ‘Detroit Rock City’ but now that is in doubt. Why go through all that hassle? Just release the whole show! Bottom Line: Gene and Paul get some of my money again and I get a four disc set of previous releases and one new release. I’ve listened to this disc non-stop and it’s an average period piece. If they released it when they should have, I’d be more attached to it. Time to check on the progress of the bonus tracks and/or the Japanese version. Or will the bonuses be available when the single-disc release comes out? And the KISS machine’s wheels keep going….. Seems like this website has been turning into Black Sabbath central as of late. My critical look on the Tony Martin years has not ended, I am currently listening to CROSS PURPOSES (1994), CROSS PURPOSES LIVE (1995), and FORBIDDEN (1995). I haven’t listened to these albums in a long time so I am giving them some extra spins. Along with those albums, I have been reading Black Sabbath: Doom Let Loose by Martin Popoff. An excellent read….. I have been listening to the new Quiet Riot album, REHAB, and I should have a review on that as well. Also, the new Taz Taylor Band (featuring Graham Bonnet on vocals) album, WELCOME TO AMERICA, has been getting some spins. The DVDs are piling up. In the queue I have: KISSOLOGY, Iced Earth – ALIVE IN ATHENS, Hammerfall – ONE CRIMSON NIGHT, the Bruce Dickinson DVD that I never finished and a Rainbow DVD in there somewhere. CDs are piling on the desk. 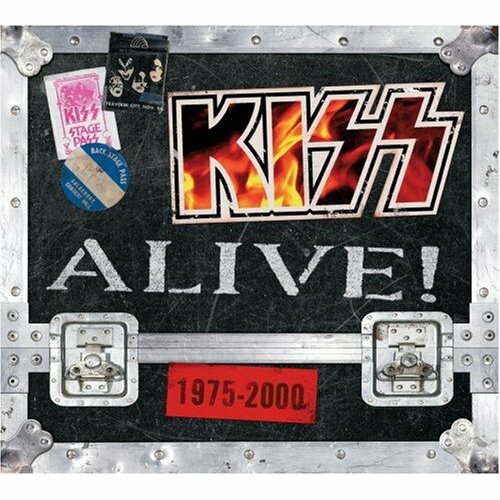 As I write this, I am listening to the KISS – ALIVE: THE MILLENIUM CONCERT. The new albums by UFO, Paul Stanley, Riot, MSG, Motorhead, Iron Maiden, and Axel Rudi Pell are still in rotation in addition to the Quiet Riot and Taz Taylor albums. CDs I haven’t listened to and/or unwrapped: new albums from Krokus, Hammerfall, Kamelot, Jon Oliva, Angra, and the two Trouble reissues. I’m going to start going through my CDs and have a “best of” list for 2006. I’m focusing on only albums I’ve purchased that were released in 2006. I am going to post this list after the Christmas holiday, by then I should have listened to all the new albums I haven’t heard yet. Personally, all is well. I’d like to be listening to more music but between the new 2nd shift schedule at work, the holidays, my 3 yr. old finding new ways to turn the house into a jungle gym, and our new puppy……well, Music has taken a back seat. I used to be able to listen to 5 or 6 albums a night at work. Now, maybe one if I can. After working all night, I could come home and listen to 2 or 3 more CDs, or watch a DVD during my daughter’s nap. Not anymore as the naps have ended and there is more to explore. I’m trying to convince my wife to move the stereo and computer downstairs but that is highly unlikely. My night off is Tuesday. My plan is to load up the MP3 player with the new albums, get some order to the CDs/DVDs waiting in the wings, and enjoy music all day. If not, I’m bound to go crazy! Note — There have been a ton of rumors and speculation regarding the HEAVEN & HELL project featuring the members Black Sabbath during the DIO years. Below is an update that should provide some insight into what is happening. Its not being called Black Sabbath because it was Tony’s decision. He said that because Sabbath was recently entered into the Hall Of Fame, Tony didn’t want to confuse anyone whos not familiar with Dio-Sabbath, and go touring with this Ozzy-less lineup. He also said it wouldn’t be right to the name Black Sabbath (I’m kinda paraphrasing that last sentence, but it was something like that). The name change has nothing to do with Ozzy or pressure from Sharon Osbourne. Tony Iommi owns the name Black Sabbath. No one else has a share in the name. Its him and him alone. Black Sabbath: The Dio Years will NOT be a box set. It will be a single disc release containing tracks from Heaven And Hell, Mob Rules, and Dehumanizer. Live Evil was not mentioned. Tony, Geezer, and Dio have written three new songs. One is a fast song, one is midtempo, and one is slow. They will be picking two for the release. The drummer for this band is still “unknown”. Bill was not present at this interview, and was not mentioned during it either. Eddie Trunk speculated it may be Vinny Appice, but nothing is known for sure. Tony Iommi wants to start playing LONGER SETS. He told Eddie Trunk he is excited to start touring with this band, and is eager to play shows around two hours long. Heaven And Hell will be touring the UK, USA, and Canada. No other countries were mentioned. The Dio Years album will be released in February 2007. Heaven And Hell will begin touring soon after. I want to address this stuff, as I’ve been innundated by emails since it was first posted (on Eddie’s blog and at Blabbermouth). Of the points above, #1 is mostly old news, although the slant about “confusion” is an odd one. If you REALLY wanted to avoid confusion, then don’t use the Black Sabbath name on the album, either. #2, #4, #5, #6 are all old news. Nothing new there. #3 is a big one. I had heard rumours that the “box set” was being reduced to two discs (on the order of 2002’s “Symptom of the Universe” set. The fact that it’s been further reduced to just ONE disc is new. And somewhat troubling. I was under the impression we were getting “Black Box II”. Now granted, ANYTHING can change between now and release, but this has been referred to as a “box set” for awhile now. I would hope it remains that way, although the reasons given could be justified, if not agreed with. #7 is news; not a huge surprise though. I think everyone sort of expected that. #8 is news, although still a rumour. I haven’t heard anything about a release date yet. FACT: Tony Iommi, Geezer Butler, & Ronnie James Dio have had this press release on their respective websites for a few weeks now. The highly anticipated reunion of Ronnie James Dio, Tony Iommi, Geezer Butler, and Bill Ward appears to be shaping up and taking a new form. After various promoters have approached their respective management; the guys have started taking all of this very seriously, as they have wanted to reunite for some time now. It looks as if the new shape may be that of Heaven and Hell – that’s the moniker that the band is likely to use on their new venture. If all goes well, Heaven and Hell should be hitting the road in early 2007. SPECULATION: Now that press release is the same on all their sites, so it’s official. It does mention Bill Ward. Now Bill Ward (whom in the matter of full disclosure I work for and do his site) has not put that announcement on his site. Does that mean he’s not in? Don’t know – I have asked for clarification from Bill and his people on that, and have not received it. Ronnie, Bill, & Geezer all mention Bill as being in, yet Bill hasn’t said so. RUMOUR: In the last week or so there’s been rumours all over the place that Vinny Appice is doing the Heaven & Hell tour, and is laying down the “new” tracks. FACT: Yet, we can’t find any sort of official confirmation of Vinny’s participation or Bill’s non participation on any of their respective websites, including Vinny’s. SPECULATION: Given there’s been no formal announcement of Vinny’s participation at this point, and the last official announcement on the matter says Bill was participating, we have to accept THAT as fact until something else is announced. Can it still shake down that way? Of course, but that’s not the official word at this time as told to me. FACT: There will be some sort of release, “Black Sabbath: The Dio Years”, which will likely contain two newly recorded tracks written by Tony & Ronnie. The band on these was said to be the Heaven & Hell lineup (although no word on keyboards). RUMOUR: Bill Ward is out – Vinny Appice is in. We shall see. RUMOUR: The “box set” has been reduced to a single disc to be released in Feb 2007. Believe me – I’d love to come to you and say what is really happening. I do not know. Eddie Trunk’s story seems fairly believable, and certain parts of it seem good. Some do not. At this point, we have to go with facts, and a lot of the stories surrounding Black Sabbath, “Heaven & Hell”, and the new recordings this past week or so have been very talked about rumour, but at this point, that’s all they are. Rumour. When I can get my hands on some official news, believe me, I’ll bring it to you. PERSONAL SPECULATION: If the set does get reduced to a single disc, I hope we eventually DO get a “Black Box II”, and that this single disc is a precursor to Black Box II like the “Symptom” set from 2002 was to “Black Box”. These albums should get the same kind of sonic upgrade that the original albums did. Rumour was that record company pressure is forcing this to a single disc. Do these people forget how well Heaven & Hell and Mob Rules sold in the early 80’s? There’s a shitload of Sab fans out there who have been clamoring for a sonic upgrade to these albums, and if we lose that upgrade due to record company pressure, well, then “middle finger” from me. Do the Dio years justice, and release a proper box set with all the albums upgraded, the Live Evil video included, as well as including all the oddball tracks from this era that are floating around. Just don’t offer to open for Ozzy again, OK? P.S. Sorry for the ramble here, I just get worked up when I see rumours accepted as fact without any sort of official announcement. No further statements are available at this time. I can also confirm that the Black Sabbath: The Dio Years release will be a single disc release – I got confirmation of that earlier this morning from my band sources. No word yet on what tracks will be on it, or whether the Feb 2007 release is confirmed – that’s all still in flux. After a long day of family, food, and friends, I am sitting here at the computer…..finally relaxing. The headphones are on, the curtains are open so I can see the rain, and I have an enormous amount of energy. Sleep will wait. My family went to my wife’s aunt’s house for dinner. The immeadiate family on my wife’s side was all there and, as we were having drinks, someone commented that “it seems wrong that we only get together at Thanksgiving, Christmas, and Easter”. I’ve been thinking of that all day. Why is it that we need special occasions to get together, enjoy the company of others, and celebrate this short thing we call LIFE? Today was a good day: a day off from work, good people, good food, a rare nap, and being able to sit down with my wife and watch some TV. I even skipped the football games today because I just wanted to enjoy the atmosphere. People don’t always get a chance to stop and enjoy…..time. That is what I am thankful for today, a chance to stop and smell the roses, to breathe and take it all in. 1. My wife and kids – I can’t imagine life without them. I have known my wife since I was ten. I remember the first day I saw her and I look forward to seeing her everyday. My children are 8 and 3 and are carbon copies of the two of us. I have never known a happiness that I feel when I am with my wife and kids. 2. Health – Luckily, I am healthy and all the people I know are as well. 3. Family and friends – Life has taken many twists and turns. I am lucky to have people in my life that accept me for who I am and who support me through the good and the difficult. 4. Our new home – It’s taken a long time to get the balls to buy a house, it can be very intimidating. We started looking and, two months later, we have our home. 5. Work – Just over two years ago, I was laid off. I went through eleven weeks of unemployment and pounding the pavement. I ended up acquiring a promotion and raise at the same company because of my experience and work ethic. Some of the people that were laid off never made it back, those who did made it back after eighteen months. even tough I may complain about my job, I’m grateful to have it. I’m able to help provide for my family. I am able to to look toward the future. 6. Music – Some people may read this and never understand but Music is so important in defining who I am. It’s a passion that I have had since I was five years old. Twenty-nine years later I still have the same vigorous appetite for Music that I did as a young boy just discovering it. So I ask the readers out there…..
Who or what are the most important aspects of your life? Were you able to stop and just enjoy? Ebay Madness – Laurence Archer breaks the bank again! 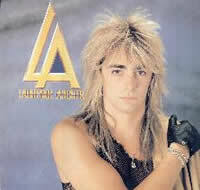 Laurence Archer – LA (Japanese CD) sells for $1376.34! A fool and his money are soon parted…..$1300+ for a single disc is a bit crazy. Well, if you win the lottery it doesn’t matter but if the winning bidder has that much extra jack to burn, then go for it! The last time this CD was featured here, mid-May, it went for $777. This is the third time I’ve seen this one go for $700+ this year and I believe a vinyl copy floated around a couple hundred a month or two ago. I haven’t heard it but I’m dying to hear the hype. Here we go again, another Tuesday, another trip to the record store. Not a big day for new releases in my world but the new KISS – ALIVE! 1975-2000 box set was tops on the list. Other notable releases: Winger – IV, Kamelot – ONE COLD WINTER’S NIGHT (2 CD live set), the new Freddie Mercury best of, and the new Manowar live DVD. First one in the door at the shop this morning, straight ahead to the new releases. Scored the Kamelot set for $11 but no Winger. At $9.99, I’ll give the new Winger a shot. Sold! To the employee behind the counter! Seeing that I beat him to all the new releases, he figured he’d beat me to the punch. If I was in his shoes, I’d hide all the new releases behind the counter for myself too. His redemption? He ordered a copy to come in Wednesday morning…..already on hold for the guy who drags his 3 yr. old daughter to a record store at 10am faithfully every Tuesday. I guess I’ll have to wait till the morning. I picked up the Manowar DVD but put it back. I have all four HELL ON EARTH DVDs and I haven’t even watched the last three, so I put it back. Same with the Freddie Mercury best of, I already have the solo albums, so is a hits package necessary? I’ll research it a little more tonight and pick it up in the AM if it’s worth having. I hate to say that I didn’t do my research before I left the house but I was a bit lazy. Went to Best Buy for the KISS ALIVE! box. It was on sale for $20 with 2 bonus tracks. The Japanese version has three bonuses but it’s not released for another three weeks and there’s no way I’m waiting on a new release from my favorite band. At least I can have the Japanese issue for Xmas. Find of the day: Hammerfall – ONE CRIMSON NIGHT DVD…..half off at $10.88. Seems that this one got lost in a price change accident a year ago (Newbury Comics dates their price tags) as the other two copies were regular price. Always nice to see the clerk take 50% off. Tomorrow is part two…..Winger and KISS releases on radar…..and I’ll probably cave on the Manowar DVD too. When I bought TYR back in 1990, I didn’t like it. Basically, it’s a concept album. Maybe not in the same way as Queensryche’s OPERATION: MINDCRIME but all the songs have a common thread. 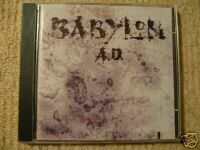 I wasn’t into concept albums so, save for a couple of songs, it got little play. Also, 1990 was the reign of the “pretty-boy” big hair Hard Rock, Metal gods like Black Sabbath were considered dinosaurs and mostly irrelevant. 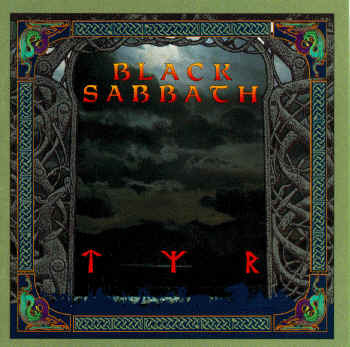 Over the years, I’ve revisited TYR and been pleasantly surprised but for some reason I still reach for THE ETERNAL IDOL or HEADLESS CROSS instead. The title track starts off with a soft chant plunges into a heavy mid-paced chug of a song, Powell’s drums crashing all around. ‘The Law Maker’ is faster with a drum intro/guitar solo intro. Tony Martin sounds almost exactly like another former Sabbath singer (RJD). Iommi just blazes away come solo time. ‘Jerusalem’ has always been my favorite song off the album. Martin’s voice soars over an amazing Iommi doom riff. Nicholls complements the guitar with a great keyboard arrangement. I would say this is the best song off the album and one of the better Tony Martin-era offerings, right up there with ‘Headless Cross’ and ‘The Shining’. Three songs in and the album is already kicked in high gear. ‘The Sabbath Stones’ slows it down but doesn’t relinquish the heaviness. I really enjoy Tony Iommi’s acoustic guitar work and it really shines within the song, inter-laced between the heavy riffs and more of Powell’s hard skin bashing. What would a Sabbath album be without an intro/instrumental? ‘The Battle Of Tyr’ is more of Nicholls’ showcase and winds right into ‘Odin’s Court’. More acoustic guitar from Iommi on ‘Odin’s Court’ and a sweeping keyboard arrangement/effect. Martin’s voice put right up front and the man sounds extremely strong. ‘Odin’s Court’ slides right into ‘Valhalla’, no pausing. Soaring chorus, Martin hitting the highs with ease and Iommi blazing a smoldering solo. ‘Odin’s Court’ and ‘Valhalla’ I consider one so they both move into the second slot for favorite song. A slow, almost sad, solo starts off ‘Feels Good To Me’. TYR’s ballad and it sounds like a late ’80s/early ’90s Hard Rock power ballad. Certainly not what I expect from Black Sabbath. It’s good, there’s a bluesy quality to it but it still seems out of place after six very strong, very heavy songs. The guitar solos just trickle out of the speakers…..very smooth. Iommi can flat out play anything and to hear him play during this song is reason enough to buy the album. Actually, his guitar work is reason to buy ANY Black Sabbath album. Cozy starts ‘Heaven In Black’ with a thunder drum roll, kicking into the guitar. Faster, heavier song that seem out of place as well. Maybe it just doesn’t fit the theme of the album? Maybe I just don’t like it? It sounds like it’s been done before. Bottom Line: Upon closer inspection, TYR measures up to THE ETERNAL IDOL but falls short of HEADLESS CROSS. It’s a strong album. Stronger than I remembered, especially Tony’s Martin’s voice. The live show must have been great because Iommi and Powell are always top-notch and I believe Martin to be at his vocal peak of his career. The guitar is always the highlight on a Sabbath album but Martin truly shines, which is one of the reason’s why a reunion of the HEAVEN & HELL lineup (with Dio) shouldn’t have happened following this album/tour. Black Sabbath’s first album for their new label, I.R.S. New label, new contract, new life? One would think so but more personnel changes ensue as Tony Iommi tries to keep his band afloat. Among the changes, Eric Singer exits and Cozy Powell takes his seat at the stool. This is a significant change as Iommi and Powell have reported good working relationship and, with the returning Nicholls (who has been with the band since 1979 in various capacities) and Martin, the band has the foundation of a solid band lineup. 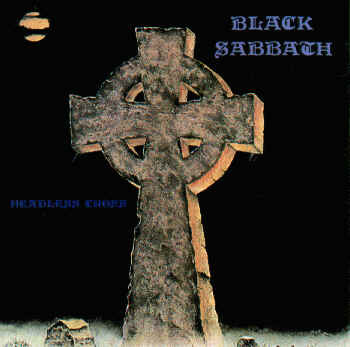 This shows in the writing: HEADLESS CROSS is more cohesive, more akin to Tony Martin’s versatile Dio-esque vocal range rather than made initially with a different type of singer like the previous album. Laurence Cottle is only a session player, he didn’t tour, Neil Murray (ex-Whitesnake/Vow Wow) is brought in for bass duties on the road. Iommi’s good friend, Brian May (Queen), plays the solo on ‘When Death Calls’ but is not credited, only thanked in the liner notes. Now that we’ve got the players straight, we can look at the music…..
Straight off we get a quick instrumental with ‘The Gates Of Hell’. Hey, every Sabbath album has at least one, right? Why break tradition? I see it as more of an “intro” to the heavy title track. ‘Headless Cross’ really gets things going in fine fashion, the opening Powell drums and Iommi riff let you know this is going to be a heavy record. It’s a mid-paced plodder but heavy, Martin hitting all the highs…..definitely my favorite track on the album. ‘Devil & Daughter’ speeds it up a bit. Great guitar inter-laced with the subtle keyboards. Come solo time, the keys kick in a little more but they don’t take anything away from Iommi’s playing. Another big drum sound on this song as well. Martin doing a good Dio here. ‘When Death Calls’ is my second favorite song on this album. A slow song but I wouldn’t call it a ballad, more of a funeral march that speeds up a little mid-way through. Now that I know that it’s Brian May come solo time, I tend to listen a little more closely as Iommi and May are my Top 2 favortie guitarists. ‘Kill In The Spirit World’ is another great track. More of a heavy Rock vibe rather than Metal, I especially enjoy the “upbeat” hook of the verses and then the change to a slower, haunting tempo for the chorus. ‘Call Of The Wild’ (originally titled ‘Hero’) is a decent song but a shade under the excellence of the first four. I tend to sing along with it, it’s still a good piece of work. ‘Black Moon’ is a heavy song that was originally recorded during THE ETERNAL IDOL sessions as a b-side for ‘The Shining’. ‘Nightwing’ is another slow track much like ‘When Death Calls’. Martin shows off his ability to hit the high notes at chorus time. I don’t like ‘Nightwing’ that much as a whole but I do like Iommi’s guitar playing on it. Bottom Line: Another improvement. This album is better than THE ETERNAL IDOL and I thought that was a solid record. I think it has to do with Martin having input into the writing and creation of the songs. Instead of coming in and just singing, he is able to help tailor the songs to his natural style. As I mentioned before, more of a band effort than a bunch of hired guns. The core of Iommi/Martin/Nicholls is made stronger by Cozy Powell’s inclusion: he had great talent and a strong drive to succeed, this added more stability. Also, new support from a new label generally helps to ease pressures a bit and keep the creative process fresh. For me, this is the high point of Martin-era Sabbath. My only complaint is that it’s only forty minutes long…..take away the instrumental and there’s only seven songs. A couple more solid songs and I think this album would rank higher up in the Black Sabbath discography. Thanks to Sleaze Roxx for putting this video on YouTube, now I can share it with everyone. From Black-Sabbath.com: There is a music video for The Shining. The video for has Terry Chimes on drums, but there is a total unknown playing bass. This person on bass in the video is not on any album or tour, he was just there for filming that day only; having literally been plucked off the street for the shoot.